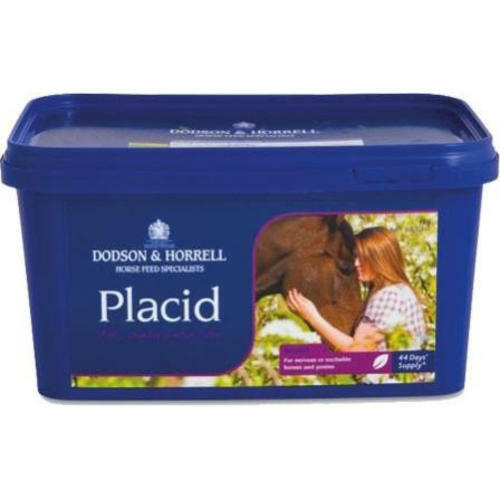 Dodson & Horrell Placid is a top quality supplement containing a combination of Chamomile, Vervain, Magnesium, Lime Flowers and Lemon Balm. This combination of ingredients has specifically been chosen for their beneficial effect on horses with behavioural issues. Chamomile & Magnesium are particularly important ingredients as they are renowned in the horse industry as efficient ingredients with genuine calming characteristics, as well as providing a positive influence on nervous system function. Ponies & smaller horses = 1.5 scoops (dried)/day or 15ml (liquid)/day. Larger Horses = 2 scoops (dried)/day or 30ml (liquid)/day.